"Ladies & Gentlemen, Magicians of All Ages!" 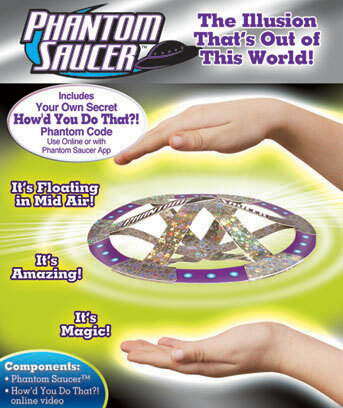 "Phantom Saucer is the illusion that's out of this world! "It's the super fun trick that you can learn super quick with our How'd You Do That?! video available online or through the Phantom Saucer App. Use your own secret Phantom Code for access! "Amaze your friends and family since only you will know the secret of the Phantom Saucer! "The more you try it, the better you fly it! So begin your Phantom Saucer magician training and learn the secret to this incredible flying sensation today!" Free Shipping (continental US only). PHANTOM SAUCER THE ILLUSION THAT'S OUT OF THIS WORLD! Includes you own secret how'd you do that! Use online or with phantom saucer app. Its floating in mid air! Its amazing! Its magic@ Phantom saucer is the illusion that's out of this world! Its the super fun trick that you can learn super quick with our how'd you do that ! Video available online or through Phantom Saucer online or through the phantom saucer app. Use your own secret phantom code for access! Amaze your friends and family since only you will know the secret of the phantom Saucer. 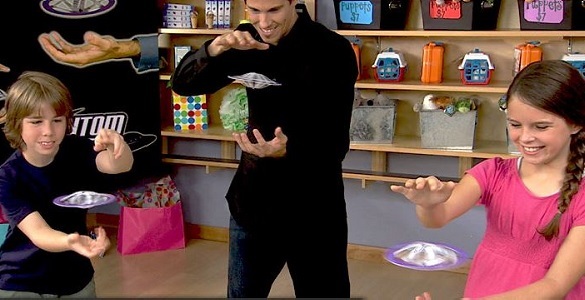 Magician training and learn the secret to this incredible flying sensation today.